How do I add a discount code in emails for my Shopify store? 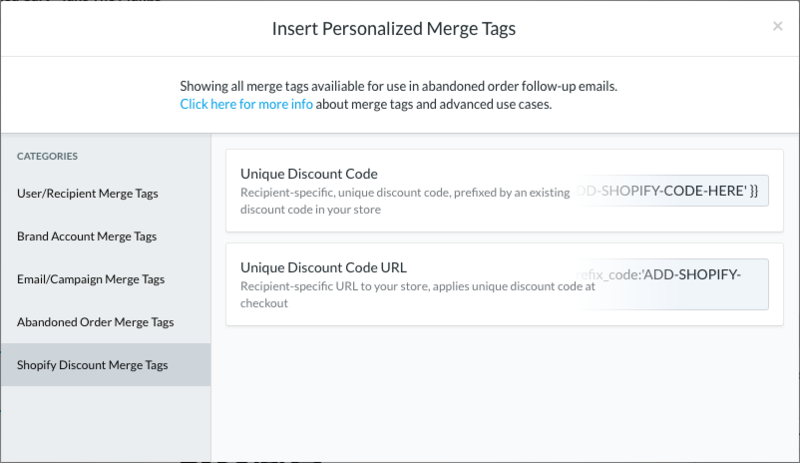 Shopify discount codes can be added in an email by inserting a merge tag. These work well in an abandoned cart or winback email journey. Click the Insert Merge Tag button in the bottom row of the template editor. Under Categories, select Shopify Discount Merge Tags, hover over and click to copy, then paste in your email. Customize SHOPIFY-DISCOUNT-CODE with one of your pre-existing coupon codes. Inserts a unique coupon code associated with a Shopify coupon code. Inserts the URL to a unique coupon code associated with a Shopify coupon code. Can be used to link text, a button, or an image. See a full list of merge tags you can include in your emails for better personalization.